We can make you any color combination helmet out of leather or fabric with your Initials on the back. The helmets come with Standard Chinstrap or 3-Point Chinstrap. We have many colors available -- View FABRIC Helmet Colors -- View LEATHER Helmet Colors. The Chinstrap and Top band and Air Hole colors: red, yellow, green, navy blue, royal blue, white, black. Chin hose colors (hose covering the top band at the chin area): black, white, clear. Initials are embroidered and can be done in most colors. These are the finest quality polo helmets made in Argentina consisting of 3-4mm Fiberglass Mesh Shell, Styrofoam Padding, Nylon Straps, Foam Liners, and Cueroflex Visor. 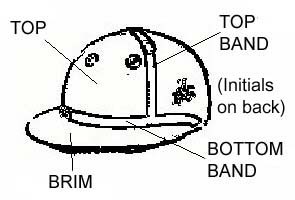 As soon as we receive this Helmet Order Sheet and your payment, we will begin to make your helmet. Our helmets are custom made and are not refundable. Thank you. View Helmet Samples. // View 3-Point Chinstrap. // View FACEGUARDS. Paste this order sheet into an email. Complete - Contact Information & Helmet Specifications.